BANGI, 16 Dec. 2010 – The 4th edition of the Malaysia-South Korea workshop on nanotechnology has taken on a higher profile, coming close to the heels of the summit meeting of their two national leaders last week. Prime Minister Dato’ Seri Najib Tun Razak and Korean President Lee Myung-bak had met in Putrajaya last week and agreed to a wide-ranging series of initiatives to foster closer ties between the two nations that included nuclear energy and bio-nanotechnology. President Lee who was on his maiden visit to Malaysia and Najib had, in a way, set the tone and purpose for the two-day 4th Korea-Malaysia Joint Workshop on Nanotechnology that was attended by scientists and researchers from the Seoul National University (SNU), Kyungpook National University (KNU) and Universiti Kebangsaan Malaysia (UKM). “President Lee Myung-bak’s visit has highlighted closer collaboration in bio-nanotechnology with Malaysia and we will certainly discuss and identify the areas for cooperation, “ said the leader of the Korean delegation, Prof Dr Jang Kyoo Shin of KNU, before heading for the last session of the workshop. Leader of the Malaysian delegation, Prof Dato’ Burhanuddin Yeop Majlis, said they were “excited” over the new development and they had identified the areas for collaboration at the workshop which ended on Tuesday (Dec. 14). “We will certainly seize the initiative to continue to explore and identify the areas for collaboration, besides sharing and exchanging experiences and knowledge,” said Prof Burhanuddin, who is the Director of the Institute of Micro Engineering and Nanoelectronics (IMEN) of UKM. He said IMEN’s budget for next year would include allocations for sending UKM’s academic staff and students to Korea for training and exposure, in addition to inviting the Korean scientists and researchers to Malaysia as visiting professors. He also said that although UKM is to be the hub of education, the research facilities at IMEN are still not as good as those found in SNU and KNU which are top universities in Korea. 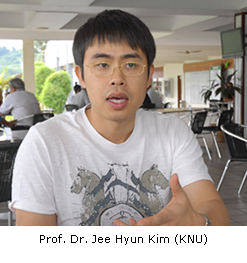 At the same time, UKM academics, scientists and researchers hoped to get their work published in leading journals through this cooperation and collaboration with Korea, he added. The birth of the workshop, he said, can be traced to Prof Jong Duk Lee of SNU, a highly respected Korean academic who came to UKM as a visiting professor in 2007. Through his efforts, the first workshop was held in Seoul in 2007, while the second was hosted by UKM in 2008. 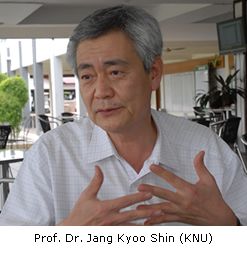 By the 3rd workshop in Korea 2009, KNU was included, he said, adding that UKM had recognized the excellent work done by Prof Jong Duk Lee by conferring him with an honorary professorship. Meanwhile, Prof Dr Jee Hyun Kim of KNU said the workshop is useful for them to “benchmark” their research work with each other, besides benefiting from the sharing of knowledge and experiences. Such cross-border meetings would also motivate and encourage them to make sure that their papers were of top quality. More papers on bio-nanotechnology presented at this year’s workshop in the wake of the trend in the world of bio-nanotechnology today where scientists and researchers were looking for better medical equipment and devices. 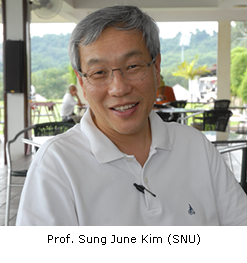 Another Korean delegate, Prof Sung June Kim of SNU, said while they would work out the details for collaboration, he hoped to promote friendship with their counterparts in UKM. “Collaboration will work if they are complementary and not competitive. But it is very hard to compete constructively, so hopefully, we can be more friends than competitors,” he said. All the three Korean scientists said both the Korean Government and private sector gave tremendous support and funding for bio-nanotechnology research in keeping with the worldwide trend. Conglomerate SAMSUNG, said Prof Kim of KNU, has a budget of about US$3 billion for R&D on bio-nanotechnology in its search for bio-medical engineering equipment and devises.